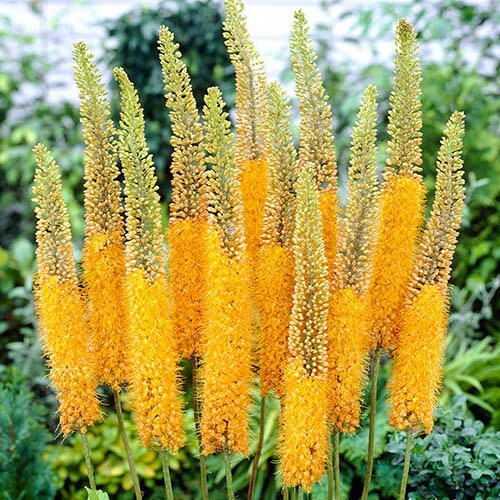 Like a giant exclamation mark, let this foxtail lily punctuate your garden with colour. Add height and interest to your garden with spectacular flowers from this compact growing plant. Spires of amazing golden-yellow blooms are long-lasting and impressive. Add height and dramatic interest to your garden this year with the striking Eremurus 'Pinokkio' a fully hardy yet exotic-looking perennial that will delight everyone who sees it. The elegant flower spike of this variety is crowded with rusty orange buds which open to peach flushed, golden-yellow flowers. A relatively compact form, 'Pinokkio' tolerates more exposed positions where it will put on a dazzling display. Easy to grow, we'll send you a large established plant in a 4L pot, (saving you valuable growing time) ready for immediate planting - then you can leave them alone! Foliage begins to die back after flowering and should be allowed to die back naturally. Unless you are keeping seed, flower spikes can be removed when the blooms have dropped.